27. G. Palermo, C. G. Ricci and J. A. McCammon. The invisible dance of CRISPR-Cas9. Molecular simulations unveil the molecular side of the gene-editing revolution. Physics Today, 2019, 72, 4, 30. 25. G. Palermo,† L. Casalino, A. Magistrato and J. A. McCammon. Understanding the mechanistic basis of non-coding RNA through molecular dynamics simulations. J. Struct. Biol., 2019. Accepted. 24. S. J. Wodak. et Al. Allostery in its many disguises: from theory to applications. Structure 2019, 4, 566-578. 23. G. Palermo,† J. S. Chen, C. G. Ricci, I. Rivalta, M. Jinek, V. S. Batista, J. A. Doudna and J. A. McCammon. Key role of the REC lobe during CRISPR-Cas9 activation by “sensing”, “regulating” and “locking” the catalytic HNH domain. Quarterly Rev. Biophys. 2018, 51, e9. Most read in QRB. 22. L. Casalino, G. Palermo, A. Spinello, U. Rothlisberger and A. Magistrato. All-Atom Simulations Disentangle the Functional Dynamics Underlying Gene Maturation in the Intron Lariat Spliceosome. Proc. Natl. Acad. Sci. USA 2018, 115, 6584-6589. 21. G. Palermo,† C. G. Ricci, A. Fernando, R. Basak, M. Jinek, I. Rivalta, V. S. Batista and J. A. McCammon PAM-induced allostery activates CRISPR-Cas9. J. Am. Chem. Soc. 2017, 139, 16028–16031. Journal Cover Art. 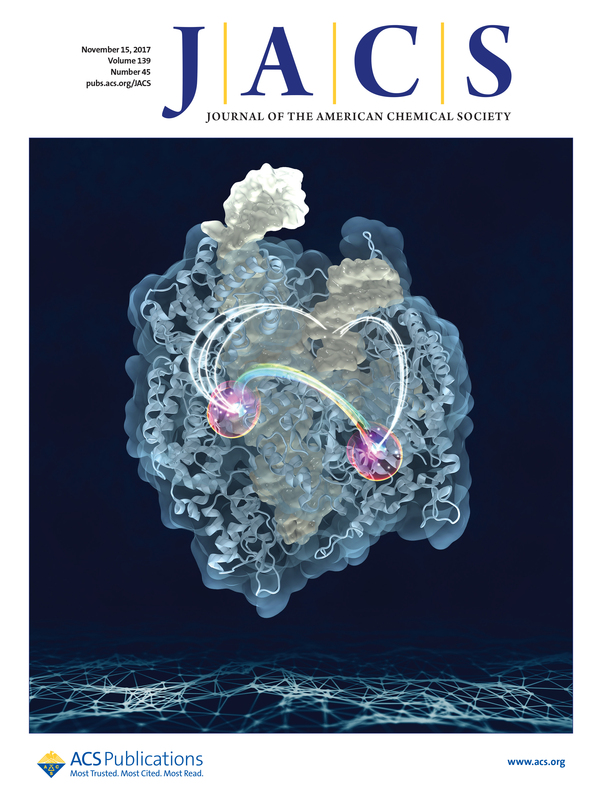 Featured in the JACS 2018 Young Investigators Virtual Issue! 20. N. Ashari Astani, S. Meloni, A. H. Salavati, G. Palermo, M. Graetzel, U. Rothlisberger. Computational Characterization of the Dependence of Halide Perovskite Effective Masses on Chemical Composition and Structure. J. Phys. Chem. C. 2017, 121, 23886–23895. 19. G. Palermo,† Y. Miao, R. C. Walker, M. Jinek and J. A. McCammon.† CRISPR-Cas9 conformational activation as elucidated from enhanced molecular simulations. Proc. Natl. Acad. Sci. USA. 2017, 114, 7260–7265. 18. Z. Adhireksan,* G. Palermo,* T. Riedel,* Z. Ma, R. Muhammad, P. J. Dyson, U. Rothlisberger and C. A. Davey. Allosteric cross-talk in chromatin can mediate drug-drug synergy. Nat. Commun. 2017, 8, 14860. 17. L. Casalino, G. Palermo, N. Abdurakhmonova, U. Rothlisberger and A. Magistrato. Development of Site-specific Mg-RNA Force Field Parameters: A Dream or Reality? Guidelines from Combined Molecular Dynamics and Quantum Mechanics Simulations. J. Chem. Theory Comput. 2017, 13, 340–352. 16. G. Palermo,† Y. Miao, R. C. Walker, M. Jinek and J. A. McCammon. Striking plasticity of CRISPR-Cas9 and key role of non-target DNA, as revealed from molecular simulations. ACS Cent. Sci. 2016, 2, 756–763. 15. Z. Ma,* G. Palermo,* Z. Adhireksan,* B. S. Murray, T. von Erlach, P. J. Dyson, U. Rothlisberger and C. A. Davey. An Organometallic Compound Displays a Unique One-Stranded Intercalation Mode that is DNA Topology-Dependent. Angew. Chem. Int. Ed. 2016, 128, 7441–7444. 14. L. Casalino, G. Palermo, U. Rothlisberger and A. Magistrato. Who Activates the Nucleophile in Ribozyme Catalysis? An Answer from the Splicing Mechanism of Group II Introns. J. Am. Chem. Soc. 2016, 138, 10374–10377. Journal Cover Art. 13. S. Meloni, G. Palermo, N. Ashari Astani, M. Graetzel and U. Rothlisberger. Valence and conduction bands engineering in halide perovskites for solar cell applications. J. Mater. Chem. A. 2016, 4, 15997–16002. 12. G. Palermo, A. Magistrato, T. Riedel, T. von Erlach, C. A. Davey, P. J. Dyson and U. Rothlisberger. Fighting cancer with organometallic compounds: from naked DNA to protein and chromatin targeting strategies. ChemMedChem, 2016, 11, 1199–1210. Special Issue on Polypharmacology and Multitarget Drugs. 11. G. Palermo, A. D. Favia, M. Convertino and M. De Vivo. The molecular basis for dual Fatty Acid Amide Hydrolase (FAAH)/Cyclooxygenase (COX) inhibition. ChemMedChem, 2016, 11, 1252–1258. 10. G. Palermo, A. Cavalli, M. L. Klein, M. Alfonso Prieto, M. Dal Peraro and M. De Vivo. Catalytic metal ions and enzymatic processing of DNA and RNA. Acc. Chem. Res. 2015, 48, 220–228. 9. G. Palermo, I. Bauer, P. Campomanes, A. Cavalli, A. Armirotti, S. Girotto, U. Rothlisberger and M. De Vivo. Keys to lipid selection in FAAH catalysis: structural flexibility, gating residues, and multiple binding pockets. PLoS Comput. Biol. 2015, 11, e1004231. Cover Art. 7. G. Palermo, P. Campomanes, A. Cavalli, U. Rothlisberger and M. De Vivo. Anandamide hydrolysis in FAAH reveals a dual strategy for efficient enzyme-assisted amide bond cleavage via nitrogen inversion. J. Phys. Chem. B. 2015, 119, 789–801. W. Jorgensen Festschrift. Journal Cover Art. 6. G. Palermo, A. Cavalli, U. Rothlisberger and M. De Vivo. Computational insights into function and inhibition of the Fatty Acid Amide Hydrolase (FAAH). Eur. J. Med. Chem. 2015, 91, 15–26. 5. G. Palermo, P. Campomanes, M. Neri, D. Piomelli, A. Cavalli, U. Rothlisberger and M. De Vivo. Wagging the tail: essential role of substrate flexibility in FAAH catalysis. J. Chem. Theory. Comput. 2013, 15, 1202–1213. 4. G. Palermo, M. Stenta, A. Cavalli, M. Dal Peraro and M. De Vivo. Molecular simulations highlight the role of metals in catalysis and inhibition of type II topoisomerase. J. Chem. Theory. Comput. 2013, 9, 857–862. Journal Cover Art. 3. G. Palermo, D. Branduardi, M. Masetti, A. Lodola, M. Mor, D. Piomelli, A. Cavalli and M. De Vivo. Covalent inhibitors of fatty acid amide hydrolase: a rationale for the activity of piperidine and piperazine aryl ureas. J. Med. Chem. 2011, 54, 6612–6623. 2. E. Brunk, N. Ashari, P. Athri, P. Campomanes, F. F. de Carvalho, B. F. Curchod, P. Diamantis, M. Doemer, J. Garrec, A. Laktionov, M. Micciarelli, M. Neri, G. Palermo, T. J. Penfold, S. Vanni, I. Tavernelli and U. Rothlisberger. Pushing frontiers of first-principles based computer simulations of chemical and biological systems. Chimia (Aarau), 2011, 65, 667–671. 1. G. Palermo, R. Riccio and G. Bifulco. Effect of Electronegative Substituents and Angular Dependence on the Heteronuclear Spin-Spin Coupling Constant 3JC-H: An Empirical Prediction Equation Derived by Density Functional Theory Calculations. J. Org. Chem. 2010, 7, 1982–1991. 1. G. Palermo and M. De Vivo. Computational Methods for Drug Discovery. Book chapter in Encyclopedia of Nanotechnology, 2nd Ed. Springer, Heidelberg, 2015, 1-15. 2019, April. Two talks at the 257th ACS national meeting in Orlando (FL). 2018, July. Invited speaker at the workshop “Challenges in RNA Structural Modeling and Design” at the Telluride Science Research Center, Telluride (USA). 2017, April. Four talks at the 253th ACS National Meeting, San Francisco (USA). 2016, February. Talk and poster at the 60th Biophysical Society Meeting, Los Angeles (USA). Co-chair with Prof. A. Dickson. 2015, June. Talk at the “Modeling activity vs. selectivity in metalloproteins” workshop, CECAM, Paris (FR). 2015, February. Talk and the 59th Biophysical Society Meeting, Baltimore (USA). 2014, August. 248th ACS National Meeting, San Francisco (USA). 2014, April. Talk at the 245th ACS National Meeting, New Orleans (USA). 2013, October. Talk at the “Innovative Approaches to Computational Drug Discovery” workshop, CECAM, Lausanne (CH). 2013, February. Talk at the II Computationally Driven Drug Discovery Meeting, CECAM, Genova (IT). 2016, September. Talk at the Heidelberg Institute of Theoretical Studies (Heidelberg, DE). Invited by Prof. R. Wade. 2016, September. Talk at the University of Zürich (CH). Invited by Prof. M. Jinek. 2015, October. Selected talk for the ETH post-doc day 2015. Swiss Federal Institute of Technology – Zurich. 2015, March. Talk at the Institute for Advanced Simulations, Forschungszentrum Jülich (Jülich – DE). Invited by Prof. P. Carloni. 2015, February. Talk at the San Diego Super Computer Center, University of California San Diego (CA – USA). Invited by Prof. A. J. McCammon, R. E. Amaro and R. C. Walker. 2015, February. Talk at University of Chicago, department of Biochemistry, Chicago (Illinois – USA). Invited by Prof. B. Roux. 2014, December. Talk at the International School of Advanced Studies (SISSA), Trieste (IT). Invited by Prof. A. Laio.